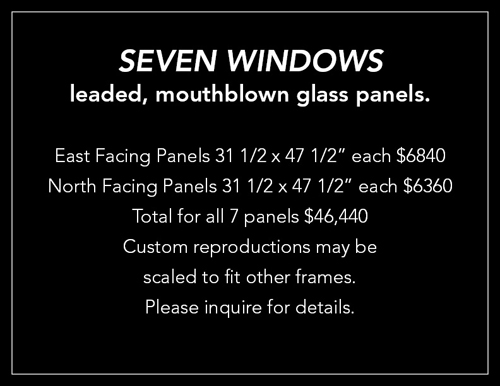 Surviving Subtlety consists of a set of leaded mouthblown-glass windows conceived, designed, supervised by koval of Winnipeg. Currently on indefinite loan to Prairie Ink Restaurant, this work has been years in the making. koval is a Winnipeg-born artist, architect and author whose application of basic organic principles to multimedia works and buildings have been rendered in drawing, glass, and mosaics. He has participated in both ecclesiastical and secular monuments including, in Winnipeg, mosaics and stained glass adornment at the Churches of St. Michael’s and Holy Family and the Ukrainian Famine Monument at Winnipeg’s City Hall. Possessing both undergrad and professional degrees in architecture, koval's independent work is ongoing and has been recognized in such publications as David Pearson’s New Organic Architecture: The Breaking Wave. His art has been exhibited in group and solo exhibits in various venues in Winnipeg, Toronto, Detroit, and Vancouver. Shunning affiliations, grants and awards, koval believes that a work of art must speak for and justify itself. This most recent exhibition to bear the title Surviving Subtlety continues an ongoing examination of the survival of subtlety and sublimity in a crass, noise-addicted, superficial society. Resolute survival and growth is evident in the continuation of the title through many exhibits, venues, and incarnations. This work was executed by artist-artisan Mark Stine of Colorado, with assistance from koval's artist assistant, Jade Shynkaruk. Probably would have been saner to be born underwater in warm fire-lit environment. Commenced socially demanded attendance at statistically compiled mind-structuring facility, 1964. From age 15, apprenticed in ecclesiastical and secular fine art. Spent 'better' part of youth in theatre - singing, acting, writing and performing humour, electronic music at various stage venues in Winnipeg and Toronto. Off-stage writing includes articles, cartooning, and poetry. Entered socially sanctioned labour force avoidance/status enhancement institution, 1976. Completed B.E.S. (Arch, U of Manitoba '79) and B. Arch. (U of Detroit, Mercy '84). Varied architectural mercenary experience in offices, 1980-1987 in "Babylon". Worked professionally in art since 1980 - drawing, leaded glass, architecture, interiors, mosaic, monumental, set design, exhibit design - from the ecclesiastical to the surreal. Contract, consultancy, and various commissioned works; as well as solo and group exhibits in assorted venues (Winnipeg, Edmonton, Toronto, Stanstead Que., Detroit, San Francisco, Vancouver). Grants and Awards - have not applied. P.R. and Marketing - not my job ["...a man's got to know his limitations..." Clint Eastwood, Dirty Harry]. C.V. - provided (...eventually...) on request to those who prefer to read about visual art. Published in New Organic Architecture: The Breaking Wave by David Pearson (University of California Press, 2001). Currently independent and rather reclusive artist/architect/(author). Do you have any specialized training beyond your degrees? Yes - pencil technique, leaded glass, sculpture casting, gilding, lettering, geometry, mosaic, granite technology, architectural collaboration and supervision of artisans, studies in scripture, psychology, history, and multiple sciences. The level of skill attained in each medium undertaken. What is your most significant singular accomplishment? Only time will tell. Any other response is hubris. How/why did you become an artist? Who/what have been your influences, inspirations? True friends, teachers, artists, poets, writers, old souls, janitors, homeless, all kind folks. What is your artist's statement? What is your art philosophy? "Das Ding Ist Selbst" (the thing itself). Each work is an aspect of it, and a glimpse of the entirety. All of them together are the singular work. Does your art hide a message? "The message" is the layers of depth and meaning, which are not at all hidden to anyone who is open, emphatic, and tuned to perceive and understand. Do you create art from life, photographs, or imagination? The Universe whispers them to me. Do you work at home, in studio, or other places? All of the above...including sometimes in my sleep. Truthsayer. Counter-balance to "the emotional plague of armoured man". One who offers an alternate way of seeing. Is your work commercially successful? It's nothing commercial - it's just personal. Is your art in any significant collection? Nope. The attainment of fame likely won't happen in my lifetime - and after that, I wouldn't enjoy it. Do you call all your exhibits "surviving subtlety"? What does it mean? Yes. It refers to the survival of subtlety, in Babylon; and to surviving being subtle, in such a society. Both can be considered rare and endangered.